Infinite_Apps is known for their Android apps like Buzz Sound, Coin Flip, Dice Roll and more. The closest they have come to releasing an actual game was Tap n’ Tap, where players try to tap as many times as possible in a given time limit. Now, Infinite_Apps has released Counter Game, so here we are. You’ve probably played Solitaire on just about every computer that you’ve ever used that wasn’t a Mac (unless you used iTunes) and not at work. Maybe you understood the game, maybe you didn’t, but you probably tried it at least once. Artifex Mundi has released the follow up to their adventure game Eventide: Slavic Fable with Eventide 2: Sorcerer’s Mirror. After the evil and immortal sorcerer Tvardovsky kidnaps a young woman from a hiking trip, a botanist named Mary must traverse through lands of Slavic and European lore to rescue her niece, Jenny, who was kidnapped. Shadowverse by Cygames has expanded the release of their new TCG called Shadowverse. There is actually quite a bit of storyline to this particular game and it looks to take a lot of inspiration from Hearthstone, especially with how the creatures look when summoned. With that aside, it actually is a decent little TCG. Nexon Korea (Nexon Company) makers of Legacy Quest, Fantasy War Tactics as well as a few others have soft launched their newest title Pinpop VEGAS, a fast-paced mobile pinball game for Android that re-imagines pinball to give players ‘an ultimate pinball experience’. Do you like Mini Golf? How about Alice in Wonderland? If you answered “Yes” to both of those questions, TapStar Interactive and Paladin Studios have a game coming for you. 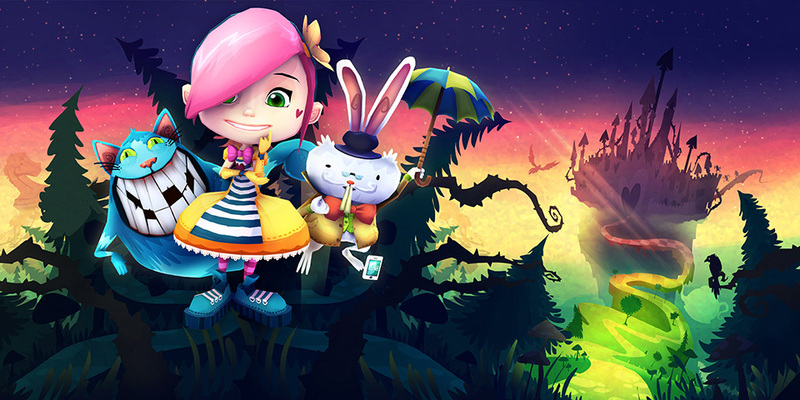 Releasing later this week is Alice in Wonderland: Puzzle Golf Adventures created by TapStar Interactive (Boulder Dash – 30th Anniversary) and Paladin Studios (Momonga Pinball). What would make Alice follow the white rabbit in this day in age? He stole her Smartphone of course. Angry Birds Action! Review: Just how amazing is the new Angry Birds game? Angry Birds Action was released last week and I immediately downloaded it to give it a try. Featuring the irritated fowls in a new setting and perspective, did this new addition to the franchise brighten up our day just a little bit more each time we play it? Let’s find out shall we! A Roblox Comparison – Which version is better, the Android one, or the Xbox One? Last weekend my youngest daughter mentioned she wanted to play Roblox more than a few times and as she usually talks almost nothing but Minecraft, I decided to find out why the sudden change. Roblox is an adventure game by Roblox Corporation and was originally released in 2006 and then on July 16, 2014 for the Google Play store.